Marta Farevaag, founding Principal of PFS Studio will be a panelist at tonight’s discussion which is part of the national talks on the newly released Plan for Canada’s Capital 2017-2067. The National Capital Commission (NCC), in collaboration with Simon Fraser University Continuing Studies (City Program), invites the general public to join the discussion in shaping the future of our national capital. 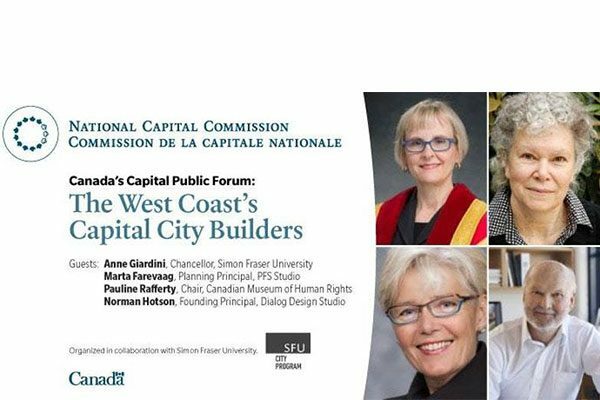 Attendees will learn more about the significant contribution of West Coast urbanists and outstanding professionals in building Canada’s capital over the last decades and will have the opportunity to share their thoughts with the panelists and Dr. Mark Kristmanson, CEO of the National Capital Commission. The panel discussion will be moderated by Dr. Mark Kristmanson, CEO of the National Capital Commission. The event is hosted by Gordon Harris, CEO of the SFU Community Trust. Event Admission: Free but reservations required. Reserve seats on Eventbrite.